In June 2014, a collector and amateur art historian emailed me about the inscription in the lower left-hand corner of the Winslow Homer (1836–1910) painting The Gulf Stream (fig. 1), just below the signature and date. This is a painting with which I had limited experience and, I must confess, for which I had limited affection. In spite of the inspired advocacy of such writers as Nicolai Cikovsky Jr. and Peter H. Wood, the earlier, chiding writings by Barbara Novak and Roger Stein were what had always resonated with me, as when Stein simply condemned it as “poorly painted, harsh in color, melodramatically overstated and terribly derivative in both its symbolism and its structure.”1 So, in order to respond to the email, I had to look at the picture more intensely, more openly, than ever before. My correspondent did not convince me about his interpretation of what the artist had written on this canvas or why he had done so. In the process of looking, however, I perceived a reading of the inscription—in what has proven to be an ironically close examination both in person and via Google photographs—fuller than has yet appeared in the most authoritative publications on the work.2 Since this inscription affirms an important but rarely heeded point concerning viewing distances, and since it might assist in a more apt appreciation of many late-nineteenth-century paintings, it seems worth sharing. Well, one artist had already done precisely that. For this observer, the paintings looked better at forty feet than they did at twelve feet away (and how many viewers today stand even that far back?). Here we can imagine him stepping back and forth in the studio, moving closer or farther away as he finds the “proper distance” from which to see the work. Homer was certainly thinking about vantage points and ways of perceiving distances with The Gulf Stream. He wrote to the director of the Pennsylvania Academy of the Fine Arts when preparing to send the picture to Philadelphia for its debut in early 1900: “This first shark is 15 ft long & the boat is 30 feet away from him—into the picture. Do not smell of this, but stand off!”23 In spite of this admonitory care, however, the painting did not find a buyer in Philadelphia. Nor, for the next six years, in any of the other places Homer sent it: Pittsburgh, Venice, Chicago, and Des Moines. Only in mid-December 1906 did The Metropolitan Museum of Art’s trustees—on receiving a petition from artists—reverse their October decision declining the opportunity to purchase the painting and, using the Wolfe Fund, acquire it as the first Homer painting for the museum’s collection. We know that between 1899 and 1906, Homer had amended the painting in ways both large and small.24 Sometime before his final work on the picture, he evidently felt the need to instruct the public in how to look at it. To anyone who had the temerity to press a nose against the picture, to sniff at or try to smell it, he gave a clear message. In the lower left corner, just below his signature and the painting’s date, Homer wrote in light-colored script, as if it were flotsam from a wreck (fig. 2): “At 12 feet from this picture/you can see it.” Long before bumper stickers proclaimed, “If you can read this you are too close,” Homer set such an admonition on the face of a major painting. Homer gives us a challenging bit of prose to parse. The idea of making one of the most harrowing of pictures be a source of fun signals either high irony or an extreme emotional coolness. And is he truly casting aspersion on the Turner painting, as it seems—echoing critical responses to the painting when it was seen in New York a quarter century before?26 If so, is he dismissing his own central figure as staffage? I suspect that, as he had done throughout his career, he straddled meanings and intentions, establishing a balance between options that forbids any definitive answer as to his purpose and his aim. His own polyvalence allows us to find multiple riches in the work. When we stand near to the canvas, we cannot help but focus on the sailor and the sharks. But if we step back, to a “proper distance,” other elements—the ocean, its might, its wonder—come to the fore. Movement back and forth allows the picture to work its Homeric magic on us. 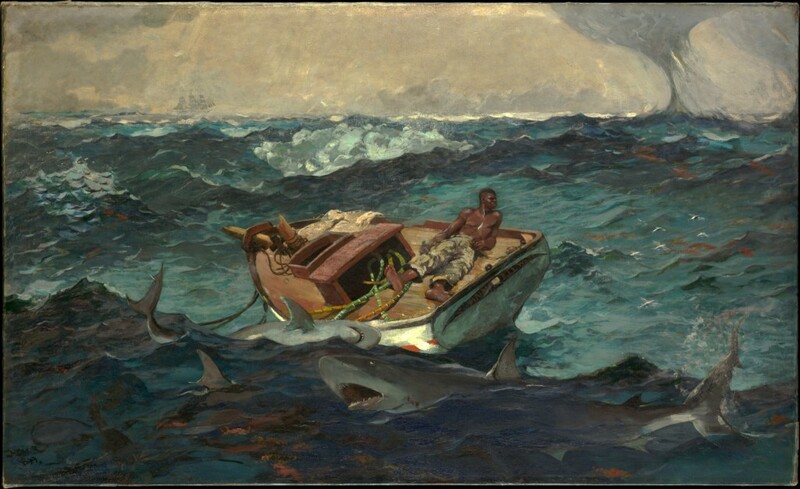 Cite this article: Marc Simpson, “‘If You Can Read This . . .’: Winslow Homer’s The Gulf Stream and the Viewing of His Pictures,” Panorama: Journal of the Association of Historians of American Art 4, no. 1 (Spring 2018), https://doi.org/10.24926/24716839.1638. About the Author(s): Marc Simpson is an independent scholar who has written extensively on Winslow Homer.